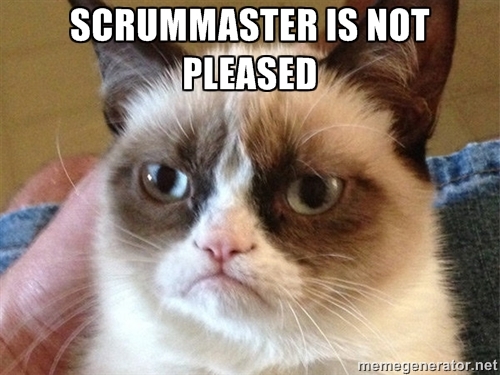 I once met an angry scrum master. He took “protecting the team” quite literally. So every time someone disagreed with the product owner, or had bad news or a question to share…he did it for them. The battles between scrum master and product owner were painful. As a distributed team (UK/US) they needed to make the most of their opportunities to work together. But every time they tried to do some planning there would be many misunderstandings and disagreements. And usually people left the conference call feeling low. After a while the team just stopped delivering. So, behind closed doors, the angry scrum master and I had our first coaching conversation. And much to my surprise the angry scrum master was a caring but frustrated individual. He was stressing and striving to do all he could for his team’s success. Over the course of our chat he came to realise that “protecting the team” did not mean inflicting help on them. Or always doing it for them (whatever “it” may be). We spoke about how it had affected his relationship with the (influential) PO. We spoke about how that in turn had affected how the team felt and how if had affected their work. We spoke about how he felt at the end of each day. He changed his outlook and made some resolution when that first meeting ended. Encourage the team members to speak for themselves. If they can’t make the sprint commitment – speak up. If they had a question for the business or each other – speak up. And if there was something that the team just couldn’t agree as a sensible thing to do – speak up. He realised his job was to help them feel comfortable opening up and to help them be mindful when someone else was sharing. In just a few short weeks the relationship between PO and scrum master recovered quite well. The team meetings became joyous, raucous exchanges of ideas, thoughts and personal commitments. They made their next release to boot!